What can be more magical than pledging your eternal love standing before the captain of a majestic sailing vessel. Upon completion of your vows the captain blows the sacred Conch horn announcing your marriage to the world and all the heavens. We specialize in custom & theme wedding charters and our staff is most willing to assist with any or all of your wedding plans. Experience the romance & adventure of the High Seas as we take you and your guests on an intimate tour of charming Key West Harbor. We Can Help You Plan A Most Magical Wedding Day! Charter one or more of our fleet of ships and sail with friends and family. We specialize in custom and themed charters and our staff can assist you with all your catering, photography and entertainment needs. Boats can be chartered by the day, week or month for extended voyages. 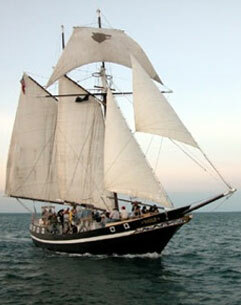 SCHOONER WOLF TALL SHIP TEAM BUILDING ADVENTURE ON THE HIGH SEAS! Skilled & Talented Crew of the WOLF for Adventure on the High Seas! 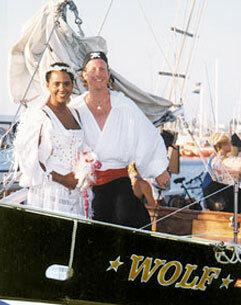 WOLF is USCG certified for up to 40 passengers, however Team Building Sail is limited to 28 participants. Pick up and drop off can be arranged at the Historic Seaport in Old Town Key West for an additional fee. TALL SHIP TEAM BUILDING Sails held rain or shine. Cancellations due to weather are the decision of the captain. For reservations, please call 305-296-9694 or email us at sailaway@schoonerwolf.com.